This is the umpteenth time I have stopped to ask. There are no sign posts of any kind. Guided by countless shopkeepers, cab drivers and Marathi women with flowers in their hair, I finally find my way off the main road on to a small side lane with stone steps leading down into a valley. So down the stairs I go, and at the bottom look to my right. A huge water tank guarded by deepstambhs, pillars to hold diyas, and surrounded by temples and dharamshalas clinging to its walls greets me with old world whimsical charm. For a few moments I almost wonder if it is all real. I hear temple bells ring in the distance and priests in white dhotis carry out ancient rituals on the talao (tank) steps. 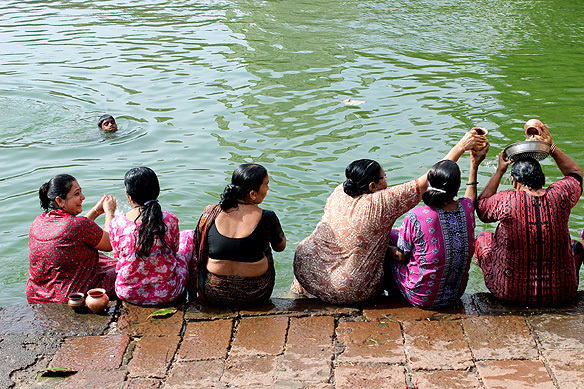 As I walk yet closer I see women dip into the sacred waters as a prelude to prayers in the temple complex; children swim with joyous abandon in the 25 feet water depths. I realize I am stepping back into another time, another world. 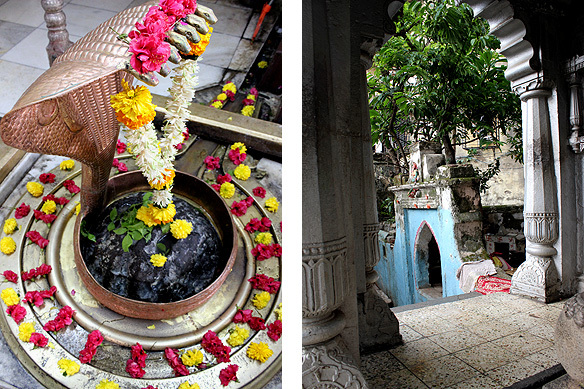 Banganga is a microcosm of the Hindu Sanatan Dharma and an ancient water tank in Malabar Hills in South Mumbai. According to legend, Lord Ram, the 7th avatar of the god Vishnu and hero of the Hindu epic Ramayana, stopped here en-route to Lanka from Ayodhya. He was on his way to save Sita from the clutches of Ravana. Thirsty, but with no drinking water in sight, Ram shot an arrow into the ground and out gushed a tributary of the River Ganges from over a thousand miles away. 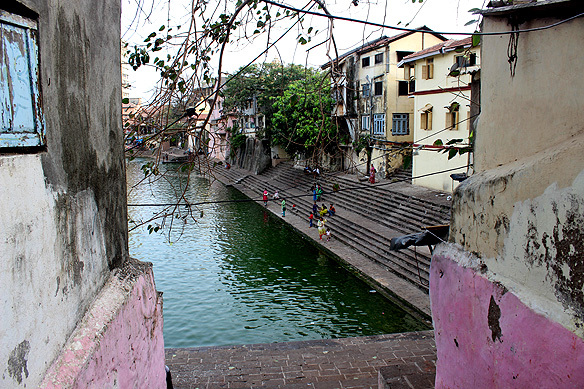 Banganga literally means Ganga created by a baan (arrow). 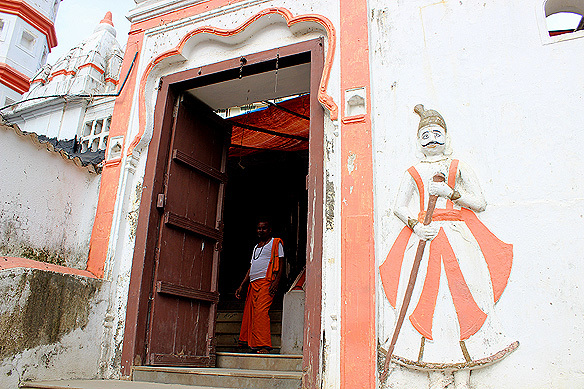 The talao, edged with temples, maths, samadhis and a cremation ground, comprise the Walkeshwar temple complex. 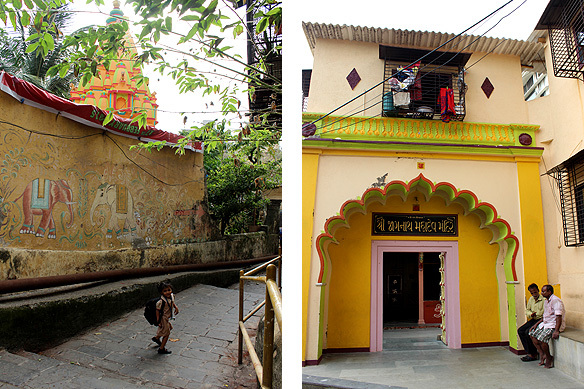 The talao, maths and main Walkeshwar Temple belong to The Gaud Saraswat Temple Trust which once owned most of the complex. 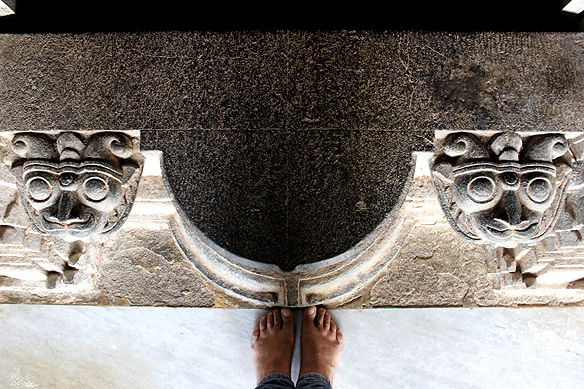 Every place of worship in the temple complex, I discover, has its own architecture, legends and rituals, juxtaposed next to each other in easy camaraderie. The stories of the priests and worshippers within are just as unalloyed. The most important and oldest temple, but unfortunately not by any stretch of one’s imagination the most beautiful, is the much reconstructed Walkeshwar aka Banganga Temple built around an ancient linga which traces itself back to the legend of Lord Ram’s stop here. Lord Ram during his halt was advised to worship Shiva. Finding no idol, he proceeded to make a linga with the sand around him. Valuka Iswar is derived from the Sanskrit words for an idol made of sand. Both, the Walkeshwar Temple and spring-fed talao were originally built in 1127 by Lakshman Prabhu, a Gaud Saraswat Brahmin minister in the court of the ruling Silhara dynasty (810—1240 AD). The temple was destroyed during Portuguese rule in the 16th Century and together with the talao rebuilt in 1715, by Rama Kamath, a Mumbai businessman and philanthropist. The Shree Venkatesh Balaji Temple dedicated to Lord Vishnu is straight out of a fairy tale book—replete with white walls trimmed with red and its own deepstambh. The wood pillared, stone domed temple in the Maratha Architectural Style was built in 1789 and houses a rare idol of Vishnu with open eyes. Vidya Sagar Maurya from Uttar Pradesh, earlier a carpet weaver is the head priest here. He makes a special prayer for me, unasked, explaining it is his dharma. Tucked nearby, a small side lane invites me to explore and I am met with an arched, miniscule shrine, the Siddheshwar Temple (1830s), amidst laundry lines and freshly washed steel pots and pans. The grounds belong to the Gaud Saraswat Brahmin families who have been living on the banks of Banganga since its formal inception. 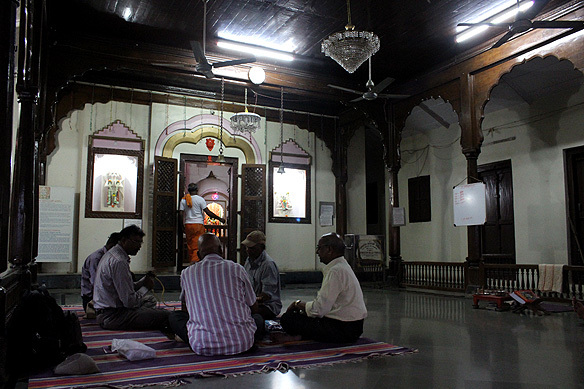 At the Shri Walkeshwar Kashi Math a Mangalorean priest, whose family has been taking care of the math for the past three generations tells me his son, a tall good-looking young man with a gentle countenance, is being groomed to take over from him. The math, along with Shri Kavle Math, are religious seats of the Gaud Saraswat Brahmins and contain samadhis of their past heads. My favourite is Ila, a tall fair beautiful woman with a huge grin from Saurashtra and the priest’s wife at the Vithoba Rukmini Temple (1913). She came to Mumbai 30 years ago. I ask her the purport of the toy horses and parrots around the main effigy. She explains Vithoba (a manifestation of the god Vishnu or his avatar, Krishna) plays with them after his lunch. We talk about marriage, men, careers; she guffaws as she claims, “Marriage is highly over rated!” Her husband receives a monthly salary of Rs. 300. I ask her how do they manage. “Who are we to manage. Vithoba gives us everything we need.” So many contradictions with so much aplomb and ease! No, she does not let me photograph her. Down the lane, the deserted, historical Rameshwar Shiva and Shree Ganapati Temples face each other to form a whole. Built in 1842 they were restored by the Indian Heritage Society to their original state. Domed roofs, jali windows overlooking the Banganga, and the shikhar of the Rameshwar temple in Nagara style are a flawless portrait of the Maratha and Gujarat fusion style of temple architecture. The sun has started to set by now and the faithful are flocking to the temples for the evening aarti. 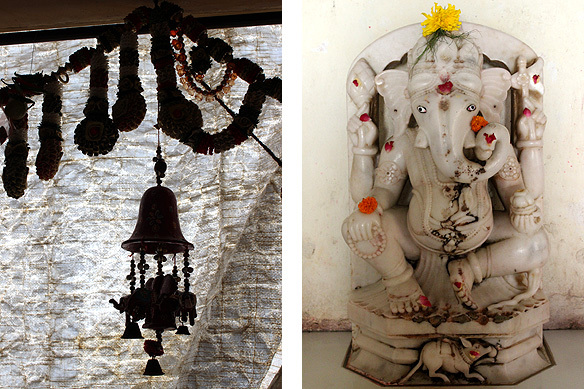 Prayers to Krishna, Shiva, Vishnu, Ganesh and Ram weave into each other in the dusk around me. 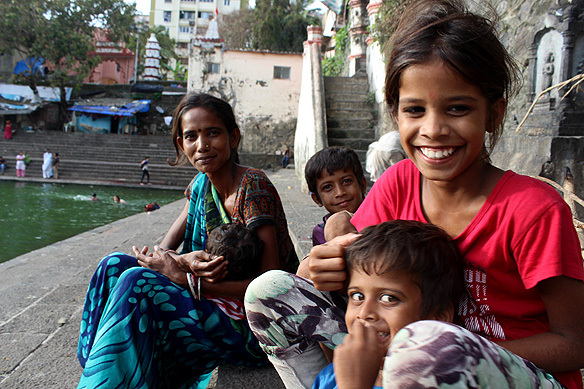 But Banganga is not just about religion and ritual. And that is the beautiful part. Seated on the steps of the talao, contemplating life, me and you, I also witness unadulterated spirituality and humanism. I see religion, colour, and social strata dissolve into nothingness and that is nothing less than a miracle for me. I have never been to Varanasi or Mathura. Today I felt, Banganga, with its many lives and layers, brought the pilgrimage experience all the way to me, in amchi mumbai. Go all the way down Walkeshwar Road in Malabar Hills, South Bombay. Pass the Raj Bhavan exit on your left. Do a U-turn into Banganga Cross Lane. After the first left are the steps leading down to the talao. This entry was posted in Bombay aka Mumbai and tagged Banganga, Hinduism, Indian Sculpture, Lord Rama, Maharashtra Tourism, Malabar Hills, Maratha Architecture, Ramayana, Rameshwar Temple, Shree Ganapati Temple, Shree Venkatesh Balaji Temple, Shri Walkeshwar Kashi Math, Siddheshwar Temple, South Mumbai, Temples, Things to see in Mumbai, Vithoba Rukmini Temple, Walkeshwar Temple by Rama Arya. Bookmark the permalink. 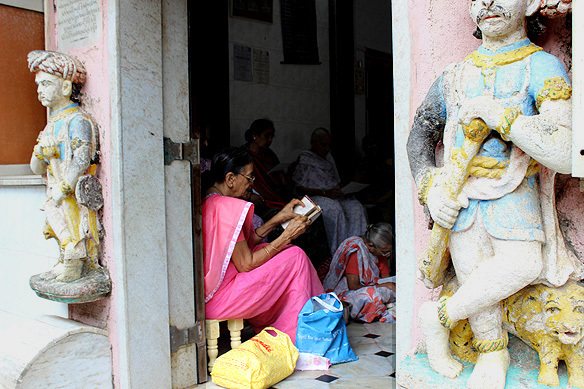 Fascinating tales of Banganga! Thank you for sharing! Glad you enjoyed reading it Magiceye. 🙂 Banganga is easily one of the most fascinating places I have explored in Mumbai since I have moved here, and more so because it is unexpected — geographically and conceptually placed right in the middle of the city’s urban jungle. Nicely written, Rama. I have been to Banganga many times, since years, but never yet with a camera… been wanting to, but somehow, every trip there just happens out of the blue, and I always leave my camera behind! the only section i have written about is a burial ground just behind the tank… where my husband’s great grandfather is buried. incidentally, he was buried and not cremated cause he took sanyas after retiring! 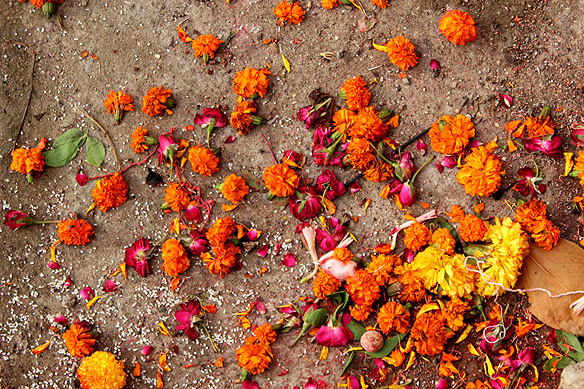 the ground is filled with such memorials, and many of saints. 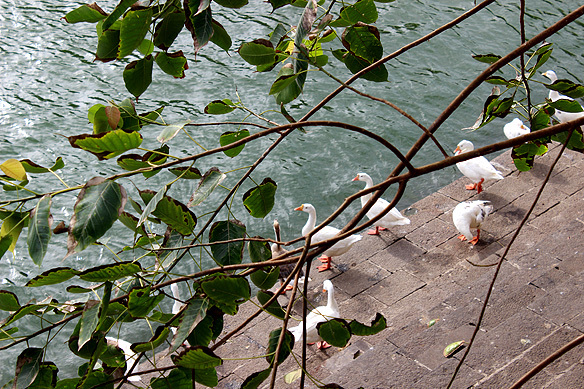 just thought to mention that here to add to your stories of banganga ! Thank you Anuradha. I now have a reason to go back and will explore the burial grounds this time. 🙂 Please do share the link of your post.